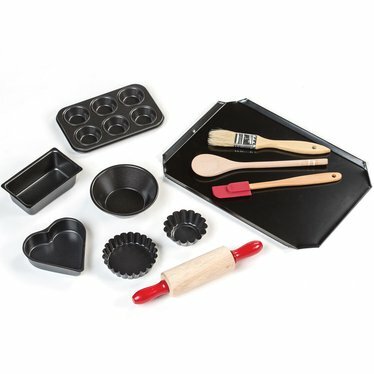 Mini pans and kitchen tools are the perfect size for children. Teach them how to make wholesome muffins or delightful mini breads and cakes. They'll have fun making and tasting their creations. Note: Non-stick pans are dishwasher safe; everything else is hand wash only. Cookie Sheet: 8-1/8" x 11-1/4"
Mini Muffin Pan: Makes 6 muffins. 4" x 6-1/8"